“I'm a great believer that any tool that enhances communication has profound effects in terms of how people can learn from each other, and how they can achieve the kind of freedoms that they're interested in”. Four bullets, four words per bullet; it’s a good target. Don’t say so much that the text wraps onto a second line. Don’t use sentences. Don’t crowd your slides. There is nothing wrong with adding another slide. A good set of visual aids will enhance your presentation by increasing the number of ways in which your information is shared and hence the number of ways your audience can use to receive your ideas. A bad set of visual aids will distract your audience from the information you are trying to communicate, and influence their perception of you. Remember that your visual aids are not your paper. They also are not the content of your presentation. They are an aid to assist your audience in understanding your spoken presentation. 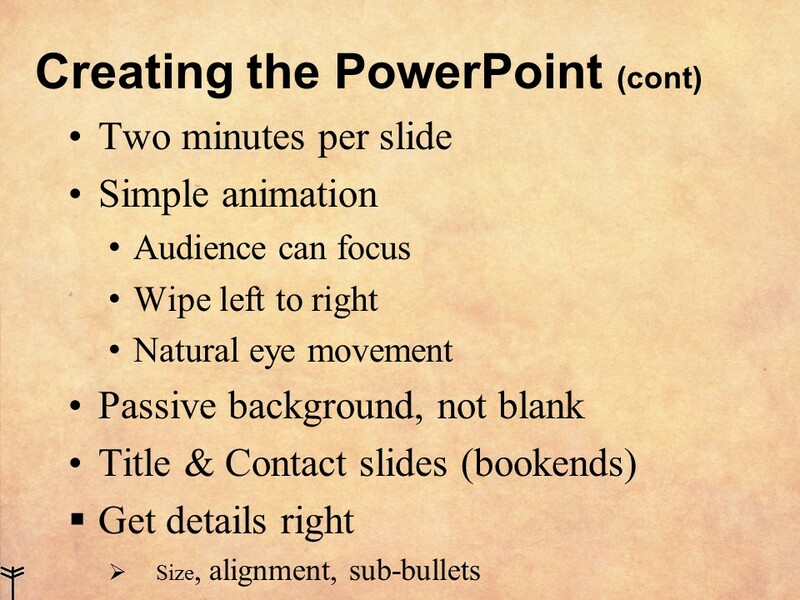 Whether you are using PowerPoint, slides, or one of the other presentation tools, follow some simple rules to make sure your visual aids are helping your audience understand. Watching people scramble to make systems work does not instill confidence in the presenters. That lack of confidence can carry over into your content. If several of you are giving papers in a single session, use one machine. Test the presentations on that machine before the session. Then test that machine in the room as early as possible. Test the remote – and yes use a remote; that way you aren’t trapped where the computer is. Text that spins around and flashes does not help your audience understand. It distracts them and gets in the way of their being able to read. The majority of your audience reads from left to right. Reveal your slides and each line of text the same way. If you are combining text and images put the image on the left. Most of the audience will return their eyes to the left when they are done reading. Your bullet points are your headlines – not sentences in your paper. Each bullet serves as a summary or lead in to the two or three sentences you will use to explain the point. Consider the bullet points in this article and the text that follows each. 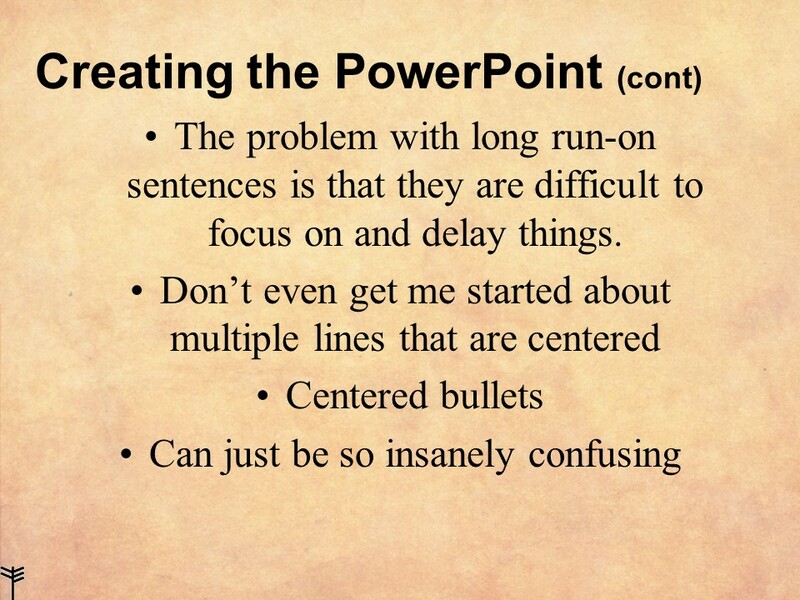 Your slide would only show the bullet text – the rest of it is what you talk about. When you put something up your audience needs time to see it or read it. Give them that time. Show one line of text. Turn and read it yourself. Then turn back to your audience and talk to them about it. By then they will be ready to listen to you. Note I did not say ‘read them the paragraphs about it’ I said talk to them! Black text on plain white is too high a contrast. Use a simple, pale background. Don’t let it become a distraction on its own. The visual aids should be restful for the eyes, not hard to read. Shifting fonts, different alignment, spelling mistakes, different bullet types – all act as distractions. They will also cause your audience to wonder – if you make mistakes here what other mistakes have you made? Use a title slide for when your audience is settling in. Include at least the title and your name. Have a slide at the end to use for the Q&A time. It should have your contact information and a location where your paper can be seen. As a rough rule of thumb figure each slide will take you two minutes to talk about. As you practice your talk (out loud) with your slides you will get a much better estimate of how long it will take. Remember on the day of the presentation the timing will be a little different since you aren’t just reading at the audience. Fig 1. A busy slide (with more than 4 main bullets) but well laid out to assist the audience. Note that there are no complex sentences, each phrase stands alone and provides the speaker a topic to cover in 1-2 additional sentences. Notice that last bullet point is incorrectly done to draw attention to the point it is trying to make. Also consider that if this content was put up all at once how long it would take the audience to absorb it. Putting the bullets up one at a time, and speaking to each as it appears aids in comprehension. Fig 2. An example of a bad slide. Consider how much more difficult this slide is to read than the previous figure. Neil Peterson is a Project Manager with over 20 years of practice. A PM’s job is 70-90% communication hence presentation skills are a regular aspect of training for Project Managers. He strongly recommends “Presenting to Win: The art of telling your story” by Jerry Weissman for those wishing to learn more.